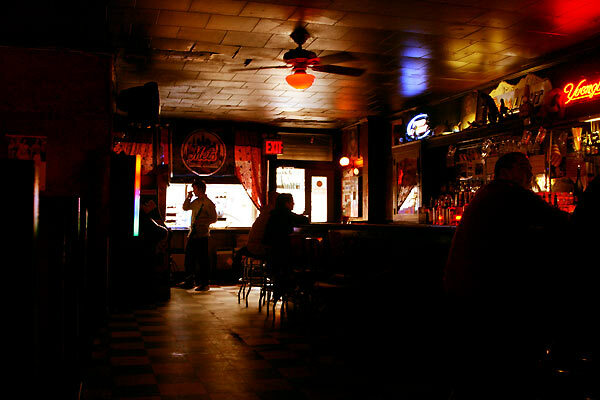 The dive bar, Gary's Last Rite is more affectionately known as "The Riot" due to the people who normally drink there. Fights between patrons are not at all uncommon. For the rough-and-tumble, Gary's Last Rite (colloquially known as 'Gary's Last Riot' or simply 'The Riot', known for the frequent fights that break out) is the ideal bar. The walls are decorated sporadically with neon signs announcing the brands of liquor that get served here. The lighting is poor, the music (or, more often, the fight or sports match playing on TV) loud, and the patrons louder. The bartenders are large and no-nonsense, the waitresses almost bored and unimpressed. This is not the place for a quiet drink. As mentioned, fights are normal and not unheard of, but should one find oneself in a scrap, one will usually also find oneself booted to the curb. The bar itself is large and takes up most of the room. It is free-standing and encircles a large set of shelves, on which stand glasses and bottles of various alcohol. In the corners of the room are television sets hung high above the commotion. There are a few scattered tables pushed up against the far walls where customers can sit to get away from the heavy scramble of the bar, but during busy nights, seating at the tables is not much better than that of the barstools. In all, Gary's is not exactly the place where one will find tourists, but it has a fiercely loyal local following.